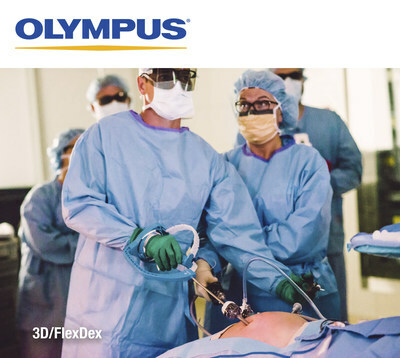 CENTER VALLEY, Pa., Dec. 3, 2018 /PRNewswire/ -- Olympus, a global technology leader in designing and delivering innovative solutions for medical and surgical procedures, among other core businesses, announced today that it has been recognized with the Surgical Products' 2018 Excellence in Surgical Products (ESP) Award, distinguishing ENDOEYE FLEX 3D and FlexDex® (3D/FlexDex) as the winner in the OR Equipment and Accessories category. This is the fifth time Olympus has been named an ESP award winner. Olympus' 3D imaging combined with FlexDex technology simplifies suturing in difficult-to-reach areas by precisely translating the surgeon's hand, wrist and arm movements from outside the patient into corresponding movements of an end-effector inside the patient's body. With a chip-on-tip and dual lens design, the ENDOEYE FLEX 3D video laparoscope restores natural 3D vision and depth perception during laparoscopic procedures and mimics what the human eye would see in open surgery. The 3D/FlexDex platform offers an alternative to high-cost robotics in minimal access surgery by providing the visualization and wristed instrumentation for suturing found in robotic technology, but at a fraction of the cost. Importantly, this technology can be used in any OR, at any time, on a laparoscopic platform already familiar to surgeons. "Olympus is honored to receive this recognition from Surgical Products," said Randy Clark, President of the Medical Systems Group at Olympus. "The Olympus 3D/FlexDex solution is an exciting addition to our portfolio. It provides both the patient and surgeon with more options compared to the alternative costs and limitations associated with robotic surgery. This allows us to stay true to our mission to drive increased quality of care, cost reductions and patient satisfaction."